You can see that I’m not just throwing all my money into holes in the ground. I am also burying it under floorboards. These are the floor joists in the future kitchen for the little apartment that is attached to the house. Back when healthy people had live – in staff, the butler or housekeeper would have lived here. Now we plug in our labor – saving devices, so this is going to be used for what, I don’t know. No way will a rental pay back what this work will cost. I can’t just let the house rot, though, and it had gotten into a state where this sort of thing was necessary. Plumbing and wiring will be laid around these joists. A finish floor will go on top. Then, hey presto, these joists will have disappeared. 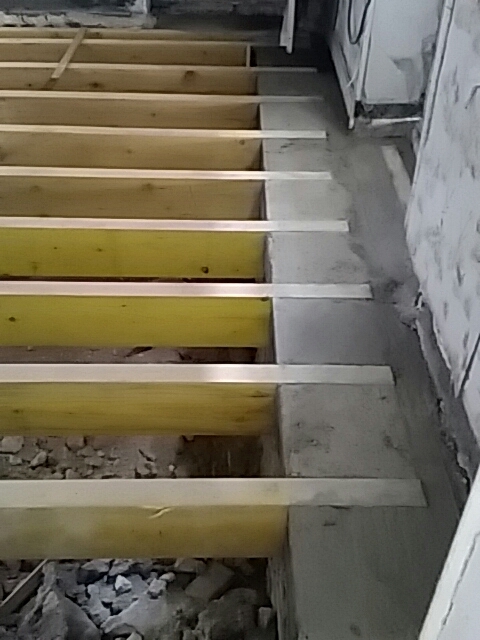 Lovely joists by the way…………………………. Oh, Gérard, the myth of the income – producing gite. That place would rent for maybe 500 euros a month as a regular rental. In summer, without a pool, it would rent for about 750 euros a week, with a pool, 1000. Did I mention that the season is 6 weeks long? The cost of renovations, just for the apartment, will be about 30K. A pool with all the trimmings, another 20K. Yes, true, it beats a poke in the eye. Unfortunately that’s about all I can say for it. Of course I’ll rent it, so tell your friends and neighbors. And of course if you and Ms. Veleckis care to grace me with your presence, a guest room will be yours.